Supply Chain Balanced Scorecard was designed to help in measuring and controlling company delivery service and associated aspects. This metrics set will help to measure the performance of manufacturing, warehouse and delivery from various viewpoints, including customer satisfaction and financial, giving key manager key performance indicators for supply chain business unit. The metric pack includes such KPI (Key Performance Indicators) as Defects Per Million Opportunities, Inventory Months of Supply, Claims percentage for freight costs, On-time pickups, Transit time, On Time Line Count, Customer Order Promised Cycle Time, providing a flexible way to improve supply chain unit performance. Logistics is a part of business processes for lots of sales and manufacturing companies. When efficient, shipping and delivery may significantly decrease the of the price of the product. Average shipping cost per unit or average time to ship a product are common kpis used across various industries. As to measurable processes, customs procedures are to be thoroughly evaluated. Download trial version of Supply Chain Measures. Purchase full version of Supply Chain Measures + bonus. Supply chain is a wide concept that aims at putting to use several resources like people, technology, organizations in such a manner that it facilitates movement of products/ services from 'point of origin' to customer. The supply chain activities change the raw materials, natural resources and other components into final product to be delivered to customers. Supply chains might consist of a number of value chains that have a common purpose of making the output reach the user in best quality and timely basis. A supply chain scorecard enables the user in moving in a statistical way to achieve the ultimate objective. This is because of the metrics that are collected on it for measuring the activities. In all, by putting down the indicators to know, in a 'quantified' manner the direction in which organization is heading, it is possible to become pro-active in approach. This in turn becomes really helpful in tilting 'challenges into opportunities'. Summing it all, one can carefully converge all the available resources to attain the single aim of developing an 'effectual delivery service'. One can use any number of views to gain a complete insight into the 'supply chain operations'. Related metrics and KPIs for: Transportation, Inventory and Warehousing, Logistics, Custom Office, Travel Agency, Procurement. Customers who viewed this item also viewed: Resource Management Scorecard | Just in Time Manufacturing Scorecard. 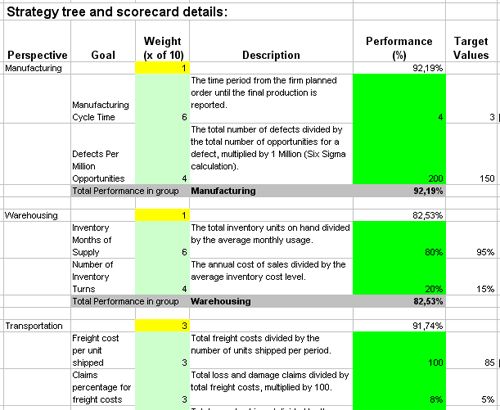 This is the actual scorecard with Supply Chain Measures and performance indicators. The performance indicators include: warehousing, transportation, claims percentage for freight costs, truckload capacity utilized, on time pickups, transit time, customer order promised cycle time, cogs percentage, year over year change in cogs, ebit percentage. Download a trial version of Supply Chain Evaluation Balanced Scoreboard or purchase a full version online. All articles about measuring performance in Transportation.